Posted April 10, 2015 by laurielmorrison & filed under Author Interviews, Middle Grade Literature, Student-Author Interview Series, Teaching. Back in the summer of 2010, I was just starting my MFA at Vermont College of Fine Arts, and Robin Herrera was graduating. At Robin’s graduate reading, she read a funny, poignant excerpt from a novel about a girl named Star Mackie, and I was hooked. I couldn’t wait to read more about Star, so I was thrilled last year when Robin’s book came out and I finally could! Hope Is a Ferris Wheel tells the story of Star, an unforgettable character who lives in a trailer park with her mom and her older sister Winter, writes hilarious vocabulary sentences that she doesn’t turn in to her somewhat clueless teacher, and says things like, “Heavenly donuts!” Star is determined to find real friends and convince everyone her layered haircut is not a mullet, and she starts a poetry club with an unlikely crew of members: two boys named Eddie and Langston, who are stuck in detention, and a sweet girl named Genny plus Genny’s grumpy brother Denny. When a couple of surprising revelations shake up Star’s view of her family, she turns to Emily Dickinson’s poetry to find a new kind of hope. 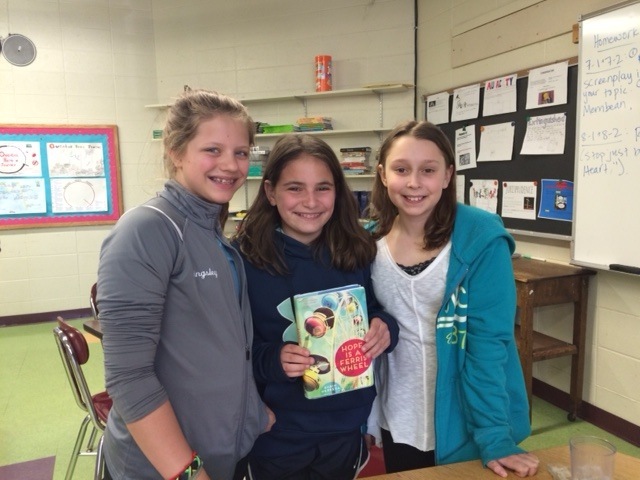 Sixth graders Emma, Mia, and Carly read Hope Is a Ferris Wheel and had some excellent questions for Robin. Winter. I also liked how Star learned to live with things not going her way, and I liked how she ranted about her life in her vocabulary sentences. Mia: I liked how when Star thought something was going to be so good it turned out awful, and when she thought something was going to be awful it turned out to be good. I also liked how she learned from Winter that you can’t always get help from other people and sometimes you have to rely on yourself. Emma: I liked the ending with the postcard and how it made me wonder what would happen next. It was funny how Star wanted to start a club because the club kept not being what she wanted, like she first wanted a trailer park club and then an Emily Dickinson club. I liked how the club ended up being a poetry club and Eddie helped her, and I liked when her teacher finally read her vocabulary sentences. Carly: Was the book inspired by your childhood in any way? Only a little bit. While I never lived in a trailer park, I did live in an area with a lot of trailers, and had a close friend who lived in a trailer—though not in a trailer park! Her family owned some land, and instead of a house, they had a trailer. A few of the details, like Star shopping at thrift stores and her admiration of Winter, were definitely based on my childhood. My sister and I didn’t have a great relationship like Star and Winter have, though. We didn’t get along until we’d grown up. Mia: How long did it take you to write the book? How long have you been writing? It took me six months to write the first draft, and I spent about three and a half years revising the book over and over before my agent sold it. 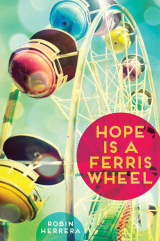 I’ve been writing for about ten years now, even though Hope Is a Ferris Wheel is the first book I ever finished writing! Emma: Did you have your plot already planned out or did it come to you as you were writing? I only had a few details of the plot planned. This book definitely did NOT have an outline, which I don’t normally like to do! I wrote the book in chunks and figured things out as I went, but it did make revising MUCH harder. I’m working on another book right now and I had a pretty detailed outline for it. Mia and Carly: If you were to make a sequel, where would it start and what would be included? Or if the book had an epilogue what would be included? Note: if you haven’t read HOPE IS A FERRIS WHEEL yet, you might want to skip over the second paragraph of Robin’s answer. I do have an idea for a sequel, though I’m struggling to write it. It’s more of a companion, which is kind of like a sequel but usually just involves the same characters. The companion would follow Eddie immediately after the end of Hope Is a Ferris Wheel, and his struggles with school, his life, and co-running the newly-minted Poetry Club. There would also be a lot of Langston. Star would be a more minor character. I’m hoping I’ll get it written someday! I can tell you about Winter, if you’re curious. Around the time I finished the first draft of Hope, I found out my sister was pregnant with her first child. That kind of informed a lot of what I thought Winter would do, so in my mind Winter keeps her child, a boy, and moves out of the trailer into another trailer in Treasure Trailers. She’d keep up with school and eventually move out of the trailer park, too, and Star would be the world’s greatest babysitter. Emma: Did you come up with the poems that Star, Eddie, Genny, and the others write? How did you come up with them? I did! They were very fun to write. I like poetry, but I really love writing it. The problem is, I write silly, funny poems. But it turned out that worked perfectly for this book! Genny’s haikus are similar to the ones I wrote when I first learned about haikus. Star’s poems were very much keyed off of Emily Dickinson’s, filtered through her own innocence. Langston’s, of course, was very easy to write! Carly: Why does Denny have such a problem with Star and Winter? Why indeed? The short answer is that he’s kind of a stick in the mud. Very serious, very ordinary, and very resistant to change. He’s also very protective of his sister, and doesn’t want her becoming the “free spirit” kind of person she’s becoming. So since he doesn’t like people who are too different, he doesn’t like Winter. And since he doesn’t want his sister becoming too different, he doesn’t like Star, whom he thinks is pulling his sister in that direction. And last but not least, the girls had a lot of questions about when Robin was in middle school! Mia: Did you have to write vocabulary sentences as a kid and did you like them? Yes I did! And I loved vocabulary sentences. I had a game I’d play with myself whenever we got a fresh batch of vocabulary words. Basically I’d try and “hide” the vocabulary word in the sentence, make it feel as natural as possible, so that if someone read the sentence, they wouldn’t be able to tell which word was the vocabulary word. So this resulted in some very long, rambling, or convoluted sentences, much like Star’s. Emma: Did you ever not turn in vocabulary sentences or any other assignments? There were assignments I didn’t turn in, though not purposefully, like Star. In 5th and 6th grade I was actually a very bad student and hardly turned anything in! My family was going through a pretty rough time, so I never got in trouble for it, really… but after the rough times, when I entered 7th grade, I did a complete 180 and started turning in all my work. Weird, huh? Mia: Did you ever start a club? No, although I was a “founding member” of a club in high school. We were called “The Movie Crew,” and we’d go see a movie every Friday, all through high school. The group grew in numbers, but always retained a core group of about four of us. We even had shirts and hats! Carly: Star doesn’t like her teacher Mr. Savage and wishes Miss Fergusson were her teacher. Did you have any teachers like Mr. Savage or Miss Fergusson? Did you have any teachers that you didn’t like, or were there any teachers you wished you had but didn’t? My 5th/6th grade teacher was very similar to Miss Fergusson. Her name was Ms. Lawson and she had that same tough but fair demeanor, underneath which she was very sweet and really cared about all her students. I never had a teacher like Mr. Savage, but I did have some bad teachers. One of my teachers in high school I think judged me harshly because he’d had my sister. (She was normally a great student, but he had her when she was a senior, after she’d already gotten into her college of choice, so she often blew off his class.) I had another teacher who often said mean things—not about me, but about other races and cultures. He was old as dirt, so no one ever called him out on it, but now I wish I had. I also had a teacher in college who for some reason didn’t like me. I never figured out why, either. Emma: Did you ever have a friend who had a sibling who didn’t like you, like Star has with Genny and Denny? I can’t think of anyone, actually! But my sister hated all of my friends. Does that count? Great interview! And Robin’s book is very quirky and fun! My question for you is, do your students make suggestions as to which authors they’d like to interview? Thanks, L. Marie, and great question! Sometimes they do make suggestions, but usually I set them up after I have noticed that a few different students have checked out a book from my classroom library or the school library. That way I know there’s plenty of interest among students, and at that point I’ll contact the author and try to set something up and then see which of the students who have already read the book want to participate and if there are any others who want to read/finish it before we meet to come up with questions! Another fantastic interview! Thanks so much for sharing your students’ enjoyment of Robin’s book and they great questions they asked. Now I want to go read that book! Thanks, Laura! I think you’ll really enjoy the book!